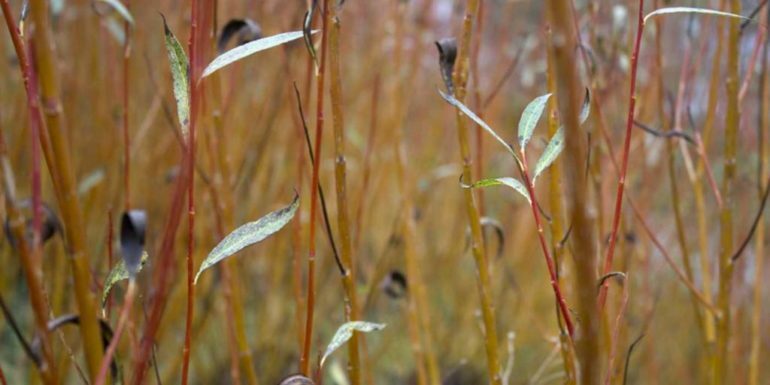 February is the perfect time to cut back Cornus’ (Dogwood) and Salix’ (Willow) interesting winter stems down to ground level. By cutting back hard like this, you are promoting the plant to re-grow vigorously which in turn forces them to create brighter, more colourful stems for next winter. Once new shoots appear in early spring Fuscias can be cut back to one or two buds on the previous year’s growth. However, you might need to do a renovation prune and can cut branches back hard to a few inches above ground level instead, this will induce new growth to sprout up from below ground level. This will depend on the age and size of your plant. As the flowers disappear you can now begin to trim winter flowering Heathers. This stops the plants from becoming too leggy. If plants do get too leggy it is best replacing them, as they do not regenerate well from old wood. In general Heathers don’t require much pruning at all, so limit it just to trimming spent flowers in the early spring. Now is also the time for lifting and dividing Snowdrops ‘in the green,’ if you want to move some to help them spread and naturalise around your garden. Deciduous hedges can be trimmed during the winter until early February before the birds start nesting. The nesting season runs until August, so vegetation works between these months is illegal in the UK. Of course, always check for nests before beginning any work on trees and hedges, as nesting can begin or end slightly earlier or later depending on temperatures.